Drawing for Win Unwritten Sterling Silver Earrings, Infinity Drop Earrings Winner Drawn September 1, 2014. Cold Soup Gazpacho has everything going for it: incredible flavor, intense color, superb nutritional benefits, and we could go on and on. In fact, we do go on and on about gazpacho when we get the chance, which is quite often, especially this time of year when fresh produce is in good supply. Whether or not you're dieting, whether sick or well, whether summer or winter, gazpacho is always a top pick. If you are the kind of cook who likes to vary a recipe to suit, you'll find gazpacho satisfies your need to mess around with someone else’s recipe. For instance, while our recipe calls for the use of an electric blender, you may prefer to use a food processor or even an immersible blender (stick blender).Do you want less garlic? Great! More garlic? Go for it. Vary to your heart’s content. Regardless, we know you will enjoy this dish. August is National Catfish Month. Blackened Catfish. Combine all ingredients in a large non-metallic container; stir well. Process in batches in an electric blender until somewhat smooth, but don't purée. Gazpacho should have texture. Chill at least 2 hours. Makes 11 to 12 cups. 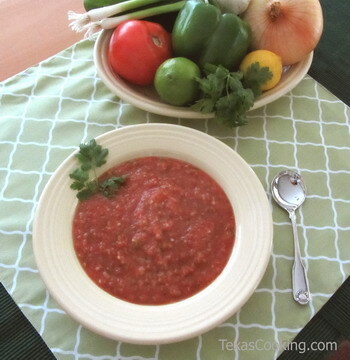 Note: It is possible to make this gazpacho even if you don't have all the ingredients on hand. It is excellent even without the tarragon and basil. I frequently make it with 1 tablespoon, each, of red wine vinegar and tarragon vinegar. Experiment and perfect it to your taste. The serving dishes in our photograph are Fiesta dinnerware. Photo: Texas Bosque County Courthouse from the excellent Texas Brazos Trail Tumblr blog. In El Paso: burgers and a car wash at Tutu's. Austin Events: Austin Ice Cream Festival, Saturday, PBS' America's Test Kitchen Live at the Long Center August 13. Ticket information. San Antonio 2014 Restaurant Week Aug 16 - Aug 23. Birthdays: Comedian Steve Martin (Born in Waco 08/14/1945). Georgia Pellegrini's book Modern Pioneering: More Than 150 Recipes, Projects, and Skills for a Self-Sufficient Life. More books The Homesick Texan's Family Table: Lone Star Cooking from My Kitchen to Yours by Lisa Fain, Austin Beer: Capital City History on Tap by BitchBeer.org. Restaurant Extortion? Lawsuit Says Yelp Made Millions Forcing Businesses To Hide Bad Reviews. Serve food on colorful Fiesta dishes. Manufactured in the USA since 1871. See the newest color poppy.